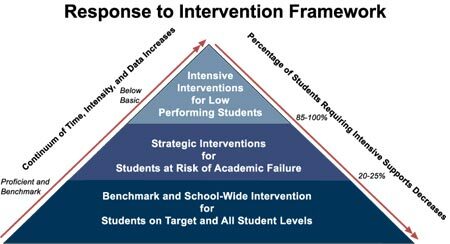 RtI offers a multi-tiered prevention and intervention approach that provides scientifically based interventions to students at risk of failure, combined with continuous progress monitoring. RtI is based on research that shows early identification and support for struggling learners will increase the likelihood of their success within the general education environment. The Education Capital Group defines “Response to Intervention (RtI)” is a multi-tiered approach to meeting the needs of struggling learners using scientifically based research practices, and systematic monitoring of student progress. RtI offers a promising alternative approach to the diagnosis of Learning Disabilities. The Education Capital Group offers an RtI Implementation Review that provides a systematic analysis of district and school readiness and capacity to implement the RtI multi-tiered approach to reading and math intervention. The RtI Implementation Review identifies district and school factors that impact implementation and provides a blueprint for effective implementation. The RtI Implementation Review results in an RtI Action Plan with specific recommendations for district-wide implementation. The Review also provides a targeted RtI Professional Development Plan focused on multi-tiered intervention and progress monitoring. The Education Capital Group’s RtI Implementation Review is based on a set of indicators that address the key elements that must be in place to effectively implement a multi-tiered approach to reading and math intervention. Key elements include District Support Structures, School wide Support Structures, and Intervention Capacity.